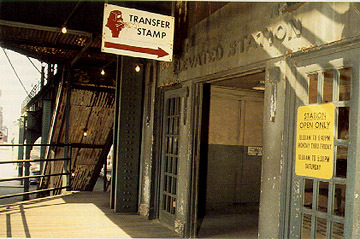 This station was constructed after the Kinzie station a few blocks south was demolished. Its Prairie School ornamentation on the interior bear a resemblance to the work of architect Charles P. Rawson at Argyle, Bryn Mawr, Thorndale and others built in the same year, indicating he may have been the architect. The exterior over the street, however, resembles an additional station house constructed at Randolph/Wells in 1913, designed by the engineering staff of the Northwestern Elevated Railroad, indicating that perhaps they were the architects. In either case, the simple but elegant curves of Grand's exterior steel framework give it an almost Art Nouveau character and a design not seen anywhere else on the elevated, save for Randolph and Merchandise Mart. Grand station served the entire Near North Side by the Chicago River for several years, until the Merchandise Mart station opened in 1930. The presence of the Mart station took away much of Grand's traffic, which was further eroded by the opening of the Grand/State subway station in 1943. By the 1960s, Grand was one of the CTA's least utilized facilities and the CTA began a campaign of service reductions. In 1958, agent coverage was reduced to rush hours only, and in 1962 this limited staffing was eliminated altogether. At the same time, trains before 10am stopped only to discharge passengers, with boarding allowed only middays and evenings. Two years later, the CTA discontinued stopping at Grand weekday evenings and Saturdays altogether, making the station available weekday morning and midday only. It came as little surprise that after such a long period of discouraged use -- steadily reducing its hours of operation virtually insured that its traffic levels would never pick up -- Grand was finally closed on September 20, 1970. 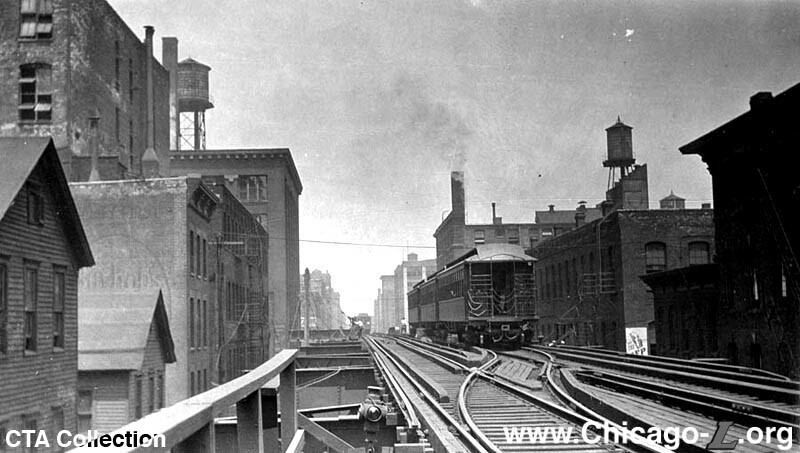 The Merchandise Mart station is only a few blocks to the south (less than a block from where the Kinzie station was).